SEO Presto! is a powerful tool available only to WordPress Premier subscribers. In just a few steps, you can use this tool to add brand new SEO search pages to your website. What is an SEO Search Page? An SEO search page looks like this. 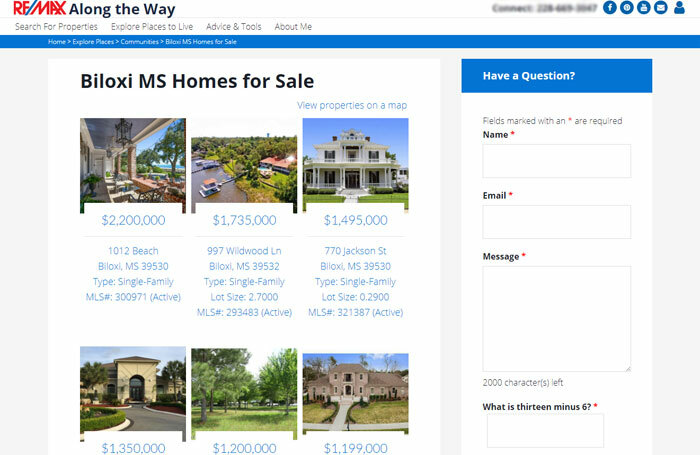 It displays thumbnail images of properties for sale and includes a link to an interactive map search. It has a custom page title, and a custom URL which are search-engine friendly and help to boost your online visibility. For an added benefit, you can add text, images, and/or videos about the area. You probably have an Explore Places to Live page in your menu, and maybe a widget on your homepage. These SEO search pages are what populate that page and/or widget. Why You Should Use SEO Presto! It is important to establish yourself as a local real estate expert. You want your users and search engines to know about the area that you serve. By adding SEO search pages, especially those rich with content, you embed important keywords into your website that help search engines bring new users to you, and help your existing users by providing convenient property searches. If you want to add searches to your Explore Places to Live page, or the widget on your homepage, you'll create them with SEO Presto! In this quick five minute video, learn how to use SEO Presto! to grow your SEO footprint and boost traffic to your WordPress website. Download a PDF with written instructions. When you create a search using SEO Presto! as described in the video, it is added to your website such that Google will find and index it. You will not automatically see your new searches under the "Explore Places To Live" menu, but you can contact us at premier@engageREmarketing.com to request that we make them visible. When you create SEO searches, you want to name each search strategically. The name of the search should be an accurate descriptor that helps search engines to recognize and index the content of the search page, and it should contain terms or phrases on which users will actually be searching. Your search name should contain the common name of the location (city, town, county, school district, etc) and the state code, as well as a domain phrase like “real estate” or “homes for sale.” If you are creating a feature search, it should also contain a descriptor of that feature. Your search name should be spelled correctly, and should use title casing. State codes should be abbreviated. Your search name should be brief, and not contain extraneous words or symbols. Your search name is not the place to add your name or phone number. If you want to add these things, add them to the content of the page.